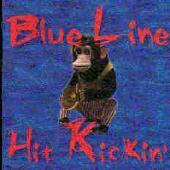 Blue Line avoids being categorized by playing a style of music that just barely doesn't fit anywhere. Fortunately, they play with an undeniable passion that carves a niche all their own. Imagine a pseudo-punk guitar beat with raging, seemingly constant, leads and a smooth, steady drum backbone. Add to that lyrics that are sometimes thought-provoking, sometimes hilarious and sometimes both and you kinda get the idea. "Mr. Clean," "Tommy Boy," and "The Biggest Freighter" are CD highlights. The band formed in 1994 and were named after the "blue line" on the hockey rink (the love of hockey being the only thing the foursome can readily agree on). BLUE LINE: Bill Parry on drums, Rickman on lead guitar, R. Hill on guitars, bass and vocals and Pud on bass, guitar and vocals. Revised: 28 Feb 2016 12:56:00 -0500.